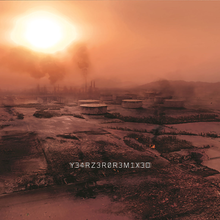 Year Zero Remixed (stylized as Y34RZ3R0R3M1X3D) is the third remix album by American industrial rock band Nine Inch Nails, released on November 20, 2007 in the United States, and on November 26, 2007 in the United Kingdom. It features remixed versions of tracks from the band's previous studio album Year Zero; these remixes were created by various producers and recording artists. This album was the last Nine Inch Nails album to be released by Interscope Records; it fulfilled the band's contractual commitments to the company, leaving Nine Inch Nails frontman Trent Reznor to proceed as a "totally free agent, free of any recording contract with any label". The album was released in three formats: digital download, CD/DVD-ROM combo, and triple vinyl. The digital download and CD releases feature the same track listing. The iTunes version lists the album title as Y34RZ3R0R3MIX3D, using the letter I in place of the numeral 1 when compared to the album's cover art. The bonus DVD-ROM included with the CD release contains multi-track files from the entire Year Zero album in GarageBand and Ableton Live formats, as well as a demo version of the Ableton Live software, and 44100 Hz WAV-format files of the album's individual track portions, for use in any non-linear music editing software such as Cakewalk Sonar or Pro Tools. Five songs are exclusive to the vinyl pressing, including the Switch remix of "Capital G", which was previously released on the "Capital G" single; and two different mixes of "Vessel". The LP was pressed on triple 180 Gram virgin vinyl at Nashville's historic United Record Pressing and features a triple gatefold jacket. The Saul Williams remix of "Survivalism" (previously featured on some editions of the "Survivalism" single) and the shortest of Bill Laswell's three remixes of "Vessel" are not included on the vinyl. ^ Cohen, Jonathan (2007-10-09). "Post-Interscope, Reznor Focusing on New Album". Billboard. Retrieved 2007-10-11. ^ Cohen, Jonathan (2007-10-08). "Nine Inch Nails Celebrates Free Agent Status". Billboard. Retrieved 2007-10-08. ^ "Nine Inch Nails: Year Zero Remixed". NIN.com. Retrieved 2008-03-30. ^ "Y34RZ3R0R3MIX3D by Nine Inch Nails". iTunes Store (US). Retrieved January 5, 2017. ^ Cummings, Ray (2007-11-27). "Remixes From the Masses". The Village Voice. Retrieved 2009-09-13. ^ a b Robertson, Alex. "Nine Inch Nails: Year Zero Remixed Review". Virgin Media. Retrieved 2008-03-06. ^ Dombal, Ryan (2008-01-03). "Nine Inch Nails: Year Zero Remixed". Pitchfork. Retrieved 2008-03-06. ^ Rayner, Ben (2007-11-20). "A cerebral hodgepodge". The Star. Toronto. ^ "CD reviews". Denver Post. 2007-12-02. ^ "ARIA Top 100 Albums – Week Commencing 3rd December 2007" (PDF). ARIA Charts (926): 6. December 3, 2007. Retrieved January 5, 2017. ^ "Lescharts.com – Nine Inch Nails – Y34rz3r0r3mix3d". Hung Medien. Retrieved January 5, 2017. ^ イヤー・ゼロ〜零リミックス | ナイン・インチ・ネイルズ [Year Zero – Zero Remix | Nine Inch Nails] (in Japanese). Oricon. Retrieved January 5, 2017. ^ "Chart Log UK: 1994–2010: Nadanuf – Michael Nyman". Zobbel. Retrieved January 5, 2017. ^ "Official Rock & Metal Albums Chart Top 40". Official Charts Company. Retrieved January 5, 2017. ^ "Nine Inch Nails Chart History (Billboard 200)". Billboard. Retrieved January 5, 2017. ^ "Nine Inch Nails Chart History (Top Alternative Albums)". Billboard. Retrieved January 5, 2017. ^ "Nine Inch Nails Chart History (Top Dance/Electronic Albums)". Billboard. Retrieved January 5, 2017. ^ "Nine Inch Nails Chart History (Top Rock Albums)". Billboard. Retrieved January 5, 2017. ^ "Dance/Electronic Albums – Year-End 2008". Billboard. Retrieved January 7, 2017. This page was last edited on 20 October 2018, at 20:50 (UTC).